The BMW i8 has been around since the 2015 model year, but I’ve just recently had the chance to get behind the wheel. In fact, I had an entire week to play with it, driving it to mundane places like the grocery store and the parent pickup line at the kiddo’s school. As you might imagine, the i8 garnered plenty of attention wherever it went. And why not? It’s the sexiest machine in BMW’s current lineup and just as exotic as anything from Lamborghini or Ferrari. Yet under its Sophisto Grey paint and carbon fiber reinforced plastic body lies some of the most sophisticated and technologically advanced drivetrain components this side of Doc Brown’s DMC DeLorean and its Mr. Fusion nuclear reactor. 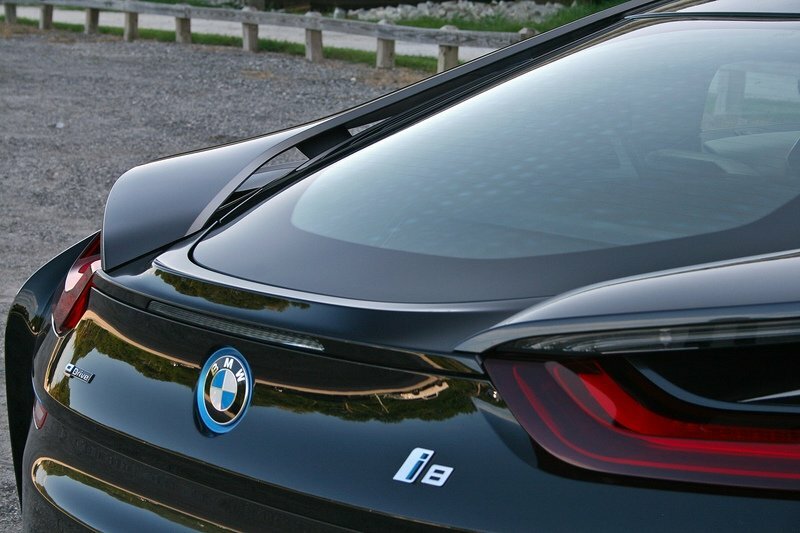 The i8, along with its less athletically inclined brother, the i3, are the current members of BMW’s i Division. As BMW’s M Division is committed to high performance vehicles, the i Division is all about electrification. For the time being, the i Division has concentrated on gasoline-electric hybrids, combining the best of both worlds into an amalgamation of efficiency and sportiness while limiting the amount of gasoline needed. Holistically, the BMW i8 lives up to its hype, delivering a 0-to-60 mph time of 4.0 seconds, a top speed of 155 mph, an EPA-estimated 76 MPGe, and a combined rating of 28 mpg when the gasoline three-cylinder kicks on. But like most cutting-edge technology and exotic supercars, the everyday experience can be a bit compromised and challenging. Continue reading for the full review of the 2017 BMW i8. Wow… Even after two years on the market, the 2017 BMW i8 continues to look like a concept vehicle let loose on the streets. From its low-slung stance and those butterfly doors to the interesting cuts and scallops carved into its bodywork, the i8 is a handsome machine with a futuristic attitude perfectly befitting of BMW’s halo car. Up front, the iconic BMW kidney grille isn’t really a grille but more of a design element that’s outlined in BMW’s i Division blue. The front’s low stance is made possible by the i8’s mid-engine design, meaning the hood can be pushed down toward the road. Only an electric motor, a radiator, and an electric fan reside under that large opening in the center. The headlights are a crowd-pleaser, too. They are the Laserlight headlights – a $6,300 option that utilizes actual lasers to generate crystal white light. Oncoming drivers don’t need to worry, though. The lasers are diffracted within the headlight lens so the light is safe to view from head-on. Nevertheless, the headlights have the standard laser warning label affixed under their clear lenses. 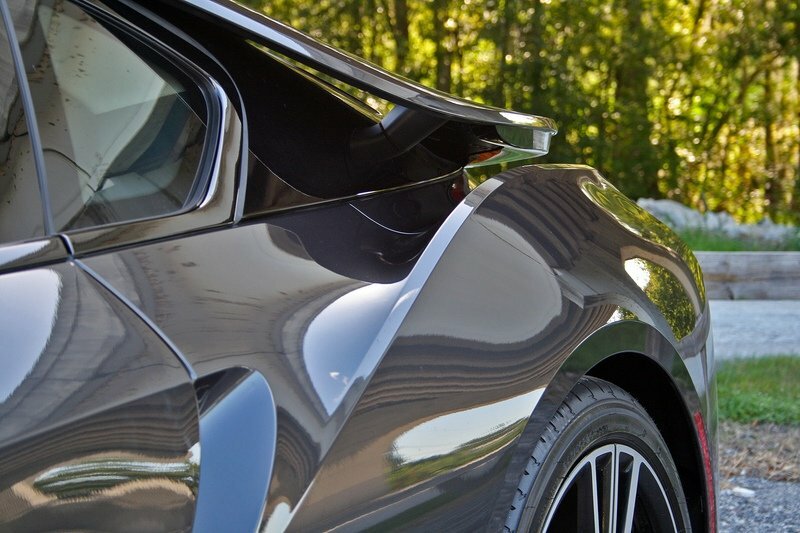 The i8’s character line grow stronger along the rear quarter panels, with a hard line running from the door sills to the top of the taillights that create a flying buttress effect. Adding even more interest is the floating panel cascading from the roofline and onto the taillights – reaching out but not touching the top of the fender. The result is a gap between the panels unlike anything see on the road today – well, short of other supercars. 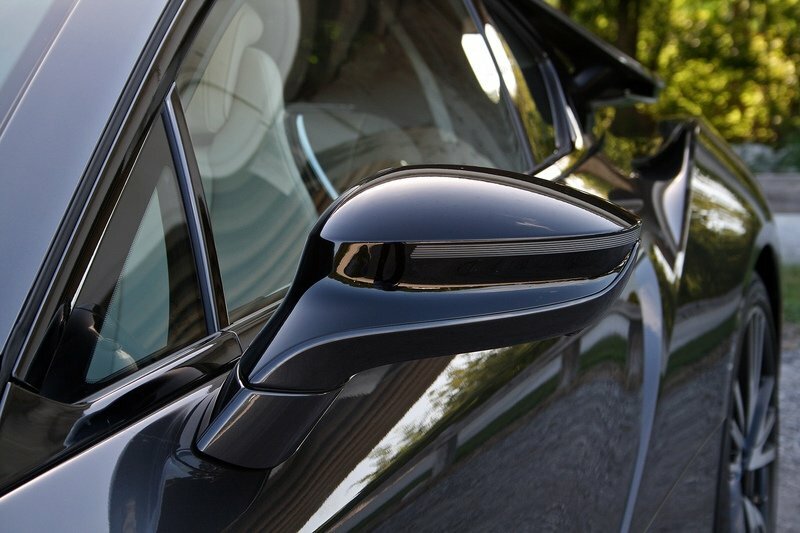 Owners of the i8 will want to wax often too, seeing as the body is comprised of some fairly high-end materials. Only the door skins and hood are metal – a lightweight aluminum. The rest of the body is a composite material mostly comprised of carbon fiber reinforced plastic. In fact, the entire safety cage is made of the stuff, evident in the door jams of all three openings. It’s a thing of beauty, really, giving the i8 yet another conversation starter. The BMW i8 rides on relatively skinny (yet friendly to fuel-sipping) 215/45R front and 245/40R rear tires mounted on 20-inch wheels. Functionally, the recharging and refueling ports are located on opposite ends and sides of the i8. 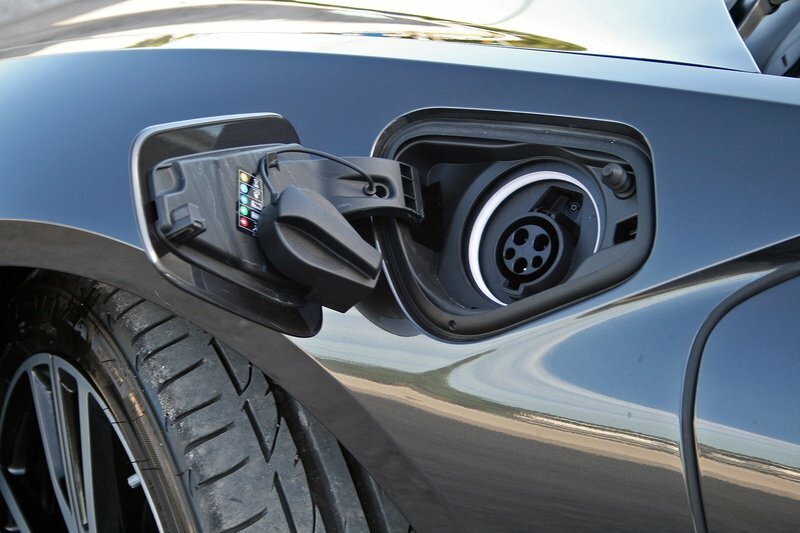 The industry standard charge port is housed behind the door on the left front fender, while the fuel filler is located on the right rear fender. Gaining access into the car should be familiar to those used to Corvettes, Ferraris, and other similar iron. An electronic latch is located within the cut-out at the door’s rear. Just depress the button with your finder tips and the keyless entry system unlocks the door. 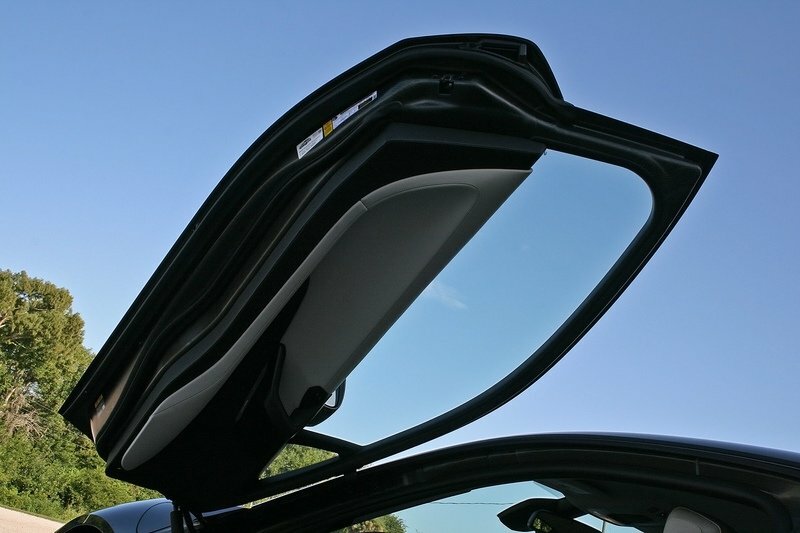 The i8’s butterfly doors are incredibly light thanks to their carbon fiber reinforced plastic shell and aluminum skin. The gas strut is perfectly weighted to give the door enough heft without being overly heavy. Getting into the rear trunk area isn’t so easy, unfortunately. There is no exterior latch or button to push. In stead, the key fob has to be retrieved from a pocket and the truck release button pushed or the driver has to open his door to press a trunk release button on the interior door panel. If there’s a secret button, I missed it and the embedded digital owners manual within the infotainment system lacked any information on it. Nevertheless, the BMW i8 is a fantastic machine to gaze upon. Its low-slung, sultry body is the stuff of bedroom posters and dreams. BMW sure knocked this one out of the park. 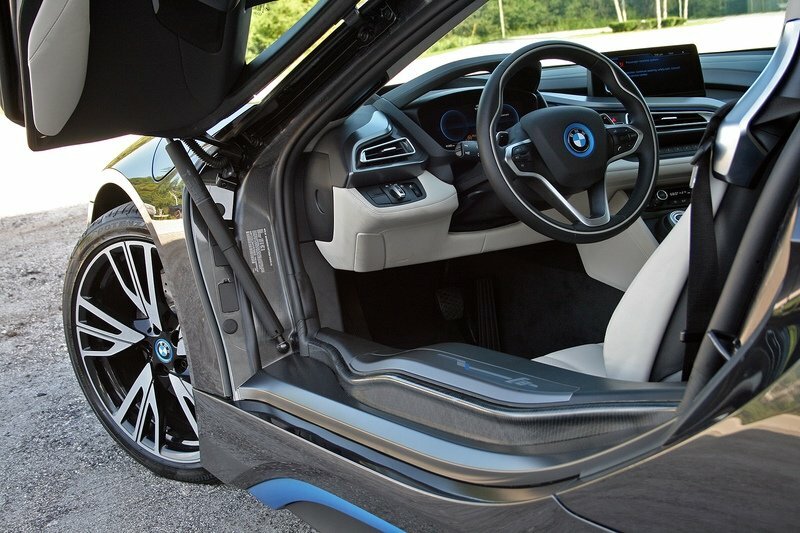 The deliciousness of the exterior continues into the i8’s interior where BMW designers did a fantastic job at conveying a futuristic cockpit without going overboard. 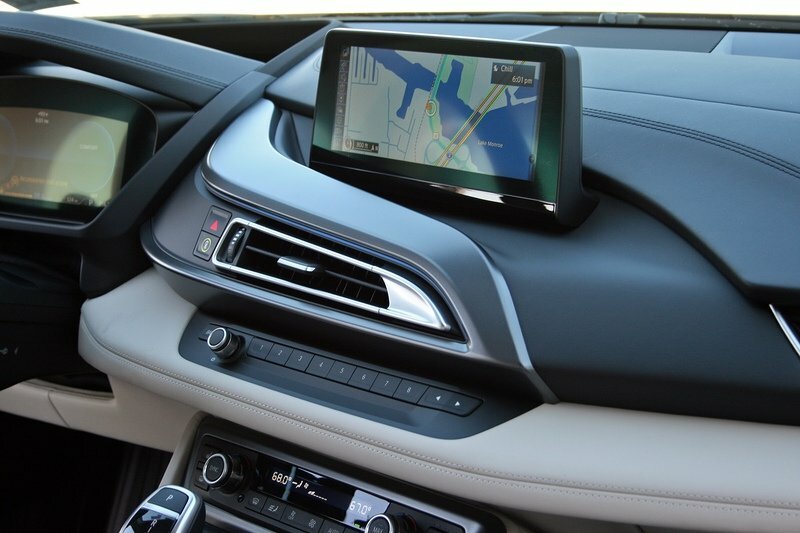 Fully digital displays and BMW’s iDrive infotainment system keep interests piqued while sculpted bucket seats hug the front occupants. Technically, the BMW i8 is a 2+2 coupe, meaning it has room for four people. That’s great in theory, suggesting the back seats could be used in a pinch, but in practice, the rear seats are only good for pre-teen kids. I tried squeezing back there, only to have a minor claustrophobic panic attack. At only five-foot, six-inches, I couldn’t sit back and have my head tilted upright at the same time. But my five-year-old daughter? She loved it – especially when getting out in front of her friends at school. Technically, the BMW i8 is a 2+2 coupe, meaning it has room for four people. But nobody is buying the BMW i8 for its back seats. Rather, this is intended to be a driver’s car, right? BMW delivers on that promises, for the most part. The seating position is very low yet comfortable within the car and the tilt-and-telescoping steering wheel has a wide range of motion to meet any driver’s needs. Outward visibility isn’t bad, even rearward, for a coupe with such a low roof. There are a few downsides in the comfort department, however. The seats don’t have any adjustability in the lumbar or side bolster sections and lack ventilation – two things that you’d suspect would come standard in a $150,000 supercar. Then again, BMW undoubtedly ditched such luxuries to reduce weight and electrical strain within the car. Yet another missing element is blind spot monitoring. Some might scoff at such a critique, but having become spoiled to the radar confirmation that my blind spots are clear, it’s a glaring omission – especially in a coupe with limited visibility towards the rear quarter panels. And its not like BMW didn’t have the technology in place to include blind spot monitoring. The i8 has radar proximity sensors for backing up. The cup holder count is on the low side, too, with only a single cup holder in the front row and two located at the back of the center console. Call me a blue-blooded American, but one cup holder and two hard-to-access cup holders is simply not enough. After all, cup holder can hold more than just cups, you know. Still, for all its quirks, the BMW i8’s interior is immaculately beautiful and well conceived. Placement of the controls is ergonomic and logical, lending to a positive relationship a driver can quickly build with the i8. It is easy to fall in love with the car – so long as you’re not having to transport people with drinks, load luggage into the trunk, check your blind spots, adjust your lumbar support, or slide over that wide door sill more than three times in a day. In reality, the i8 is build more as a weekend toy for back-road bombing and car shows than for daily driving with the family. 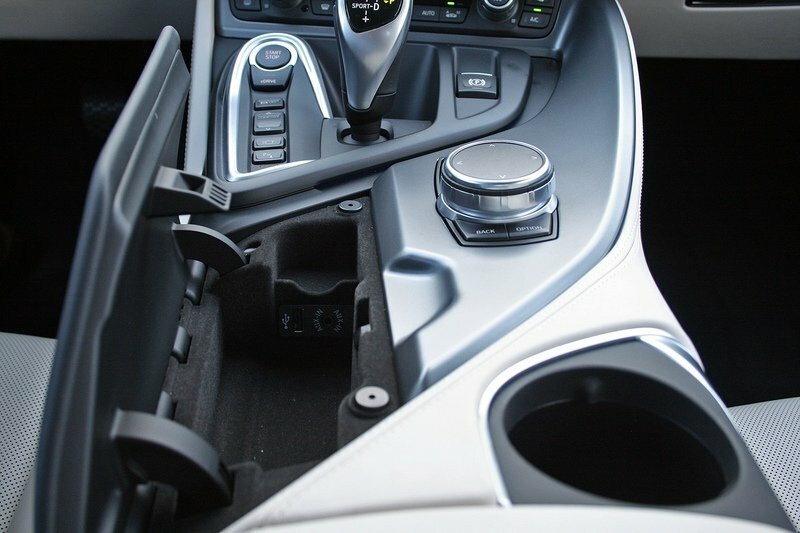 Buried deep within the i8 is its gasoline-electric drivetrain. Don’t expect to do any backyard wrenching; the i8 is simply beyond any help from shadetree mechanics. Welcome to the future. That doesn’t matter though, because the i8 boasts some outstanding technological advancements that push the envelope in what’s possible with a small-displacement internal combustion engine and electric motors. 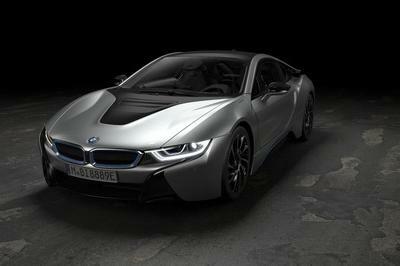 At the i8’s heart is a 1.5-liter turbocharged three-cylinder mated to a six-speed automatic transmission. This mid-mounted powertrain is responsible for powering the rear wheels, as well as recharging the 7.14-kWh lithium-ion batter located between the seats. An electric motor sits sandwiched between the engine and six-speed automatic to power the rear wheels when under full electric power. Up front, a second electric motor powers the front wheels through a two-speed automatic transmission. 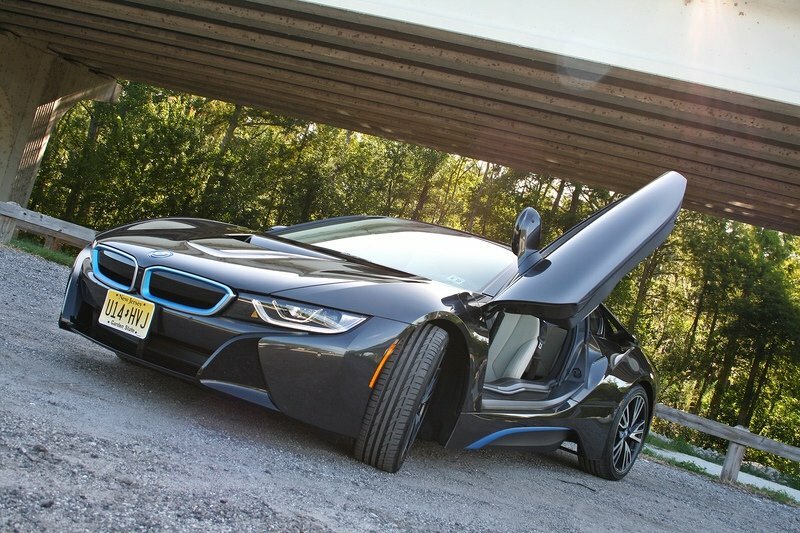 In conjunction, the powertrain gives the i8 full-time AWD with 357 horsepower and 420 pound-feet of torque. Those power specs might not sound like much, and in reality, they aren’t up to supercar levels, but at only 3,300 pounds, the i8 moves rather well. The sprint to 60 mph only takes 4.0 seconds and BMW governs its top speed to a very German 155 mph. As for driving green, the i8 only offers 15 miles of all-electric range. That’s definitely on the low side. Its saving grace is its charge times. 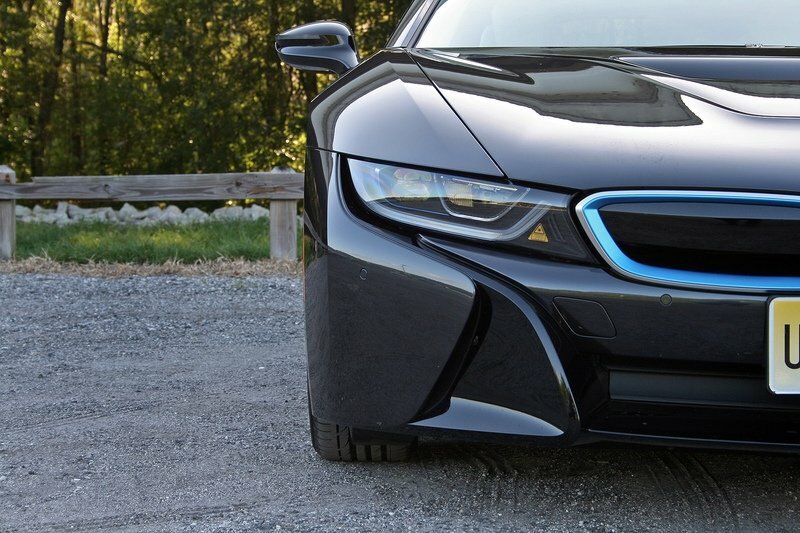 Plug the i8 into a 220-volt charging station and it only takes two hours. Use a conventional 120-volt household plug, and the charge time is roughly 7.5 hours. Better yet, putting the i8 into Sport mode automatically engages the gasoline engine, which recharges the battery to about 75 percent in roughly 15 miles. 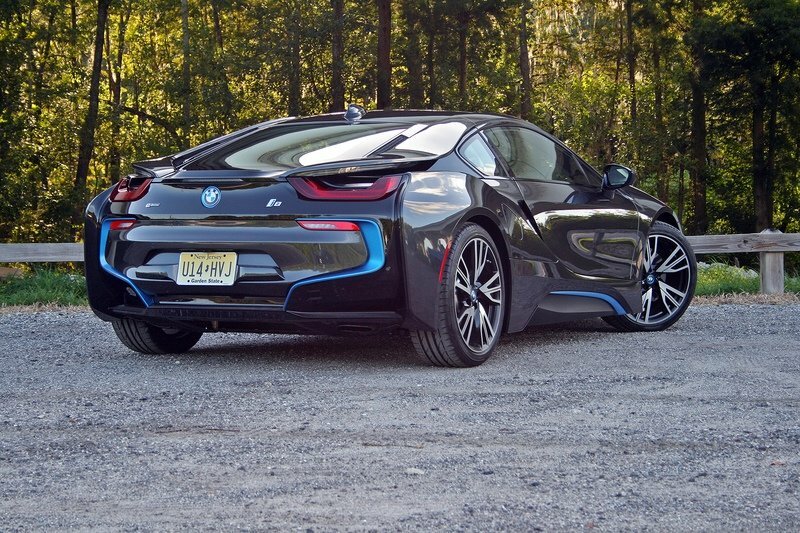 Putting the i8 into Sport mode automatically engages the gasoline engine, which recharges the battery to about 75 percent in roughly 15 miles. And speaking of driving modes, the BMW i8 has four. They are Comfort, EcoPro, eDrive, and Sport. Comfort is the default setting every time the car is started. The mode allows the engine to kick on as needed and keeps the i8’s attitude in a relaxed mood. EcoPro is similar, only it heavily dulls the throttle and attempts to keep the engine off as much as possible. 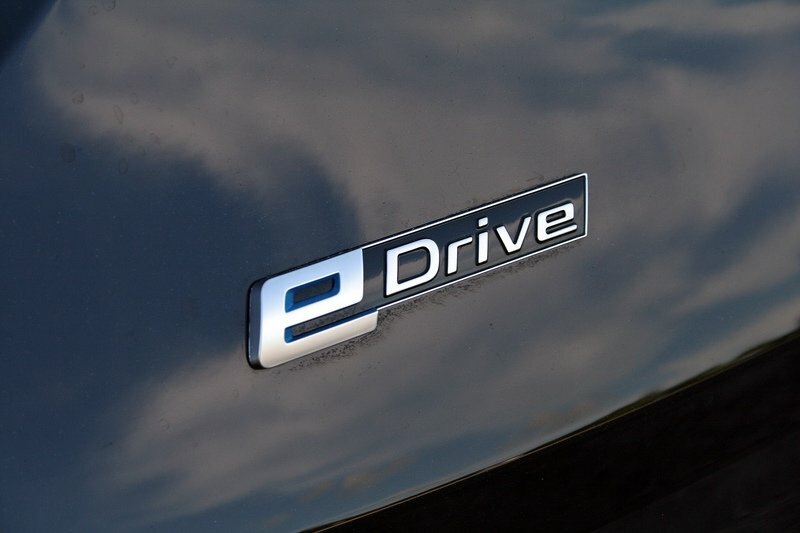 Further still, eDrive mode is for fully electric driving. The i8 allows for a battery save mode, too, giving the driver the choice when to use the all-electric range. Sport mode completely changes the dynamics of the car. The steering is more weighty, the adaptive dampers stiffen up, the throttle becomes itchier, and the exhaust note form the three-cylinder becomes much louder inside the cabin. Yes, BMW does synthesize the engine note, but dadgummit if it doesn’t sound awesome. The BMW i8 looks the part of a super car yet has the heart of a fuel-sipping hybrid. Still, BMW somehow coaxes sportscar levels of performance from the i8’s 1.5-liter turbocharged three-cylinder and 7.1-kWh battery pack. Slide the gearshifter into Sport mode and the engine kicks on with a growl. The digital gauge cluster turns from blue to red, indicating its inner anger begging to be unleashed. Accelerating is exhilarating thanks to the powertrain’s combined 420 pound-feet of torque. And because we’re talking about electric motors, a good percentage of that torque is available at zero revs. 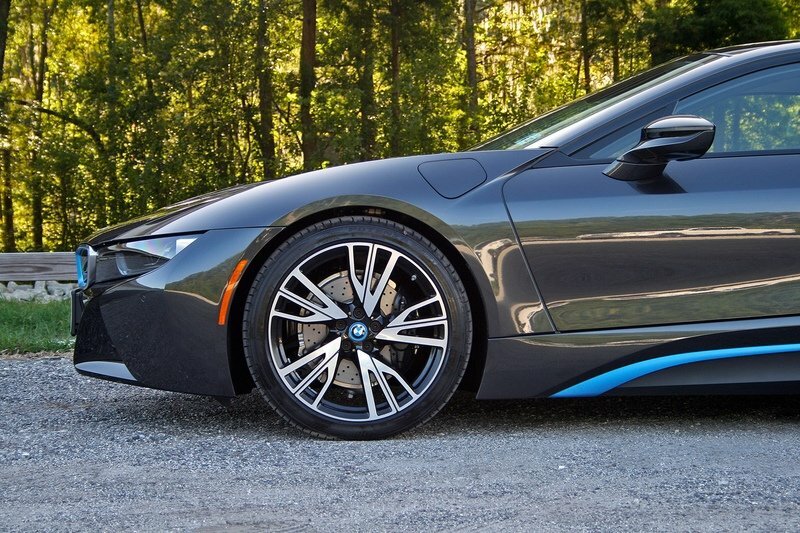 The i8 does have launch mode, too, and a simple touch of the traction control button enables the system, leaving the driver to powerbrake until the drivetrain settles into its sprinting position. Dumping the brake pedal is met with gleeful g-forces as the i8 moves effortlessly forward, hitting 60 mph in only four seconds. When not driving like premium gasoline is free, the i8 offers an incredibly smooth and quiet ride in Comfort mode. The powertrain works in the background, never really calling attention to itself, while the car simply rolls down the road. Road noise is somewhat prevalent, especially on rough pavement, but the cabin is otherwise quiet. The seats are comfortable despite not having lumbar adjustments. The 2017 BMW i8 isn’t cheap and isn’t a hybrid designed to save cash at the owner’s bottom line by costing less at the pump. No, the i8 is theory put into practice without needing an explanation. As such, those early adopter types shouldn’t have an issue with its $143,000 starting price. 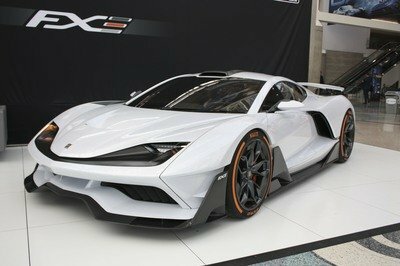 Of course, there are government rebates and tax credits that help bring the price down, but those are negligible when talking about a six-figure supercar. BMW offers two upper trim levels: the Giga World at $2,000 and the Tera World at $4,500. The Giga World adds unique leather, Eucalyptus wood interior accents, different 20-inch wheels, and LED headlights. The Laserlights are optional here. The Tera World builds to the Giga with a brown leather interior, black brake calipers, a leather engine cover (who’d have thunk?) and blue seatbelts that match the exterior accent color. My tester came with the $2,000 Giga World trim and those fancy, $6,300 Laserlight headlights. BMW also charged $995 for destination and delivery. Combined, the grand total came to $152,695. The BMW i8 is a supercar wrapped around a frugal hybrid powertrain that still offers high levels of performance. 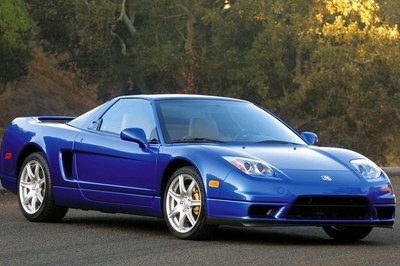 The Acura NSX, on the other hand, is a supercar wrapped around a supercar drivetrain that can sometimes act like a hybrid. 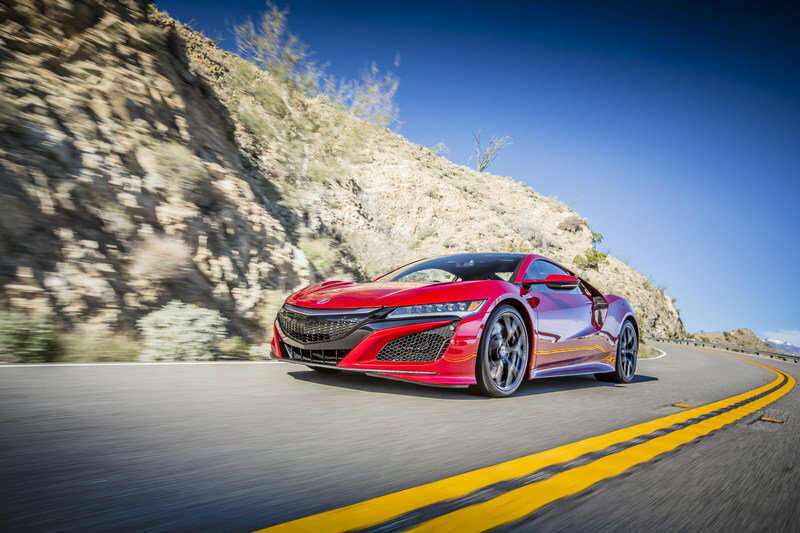 I’ve yet to drive the NSX, but from my extensive reading, I hear the Acura is more happy using its 2.5-liter twin-turbocharged V-6 than its three electric motors and questionably small 1-kWh (estimated) battery pack. As such, the NSX easily out-performs the BMW i8. 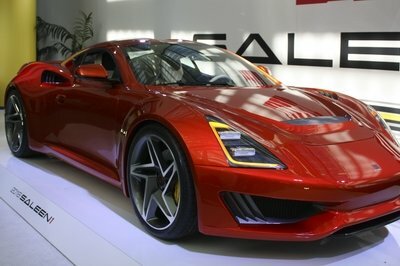 It hits 60 mph in just 3.1 seconds and is said to reach a top speed of 191 mph. The NXS uses less exotic building materials, too. It’s mostly aluminum and high-strength steel, Nevertheless, it weighs only 3,800 pounds. It powertrain layout is exotic, though. Like the BMW, the Acura keeps its engine mounted behind the driver. The narrow-angle, all-aluminum V-6 uses both port and direct fuel injection and boost from two turbos to achieve 500 horsepower and 406 pound-feet of torque. An eclectic motor mounts between it and the nine-speed dual-clutch transmission, providing another 47 horses and 109 pound-feet. Up front, a pair of electric motors generate a total of 72 horsepower and 108 pound-feet of torque. Acura says the powertrain combines to make 573 horsepower and 476 pound-feet of torque. It’s also worth noting the Acura NSX only has room for two, no matter the size of passenger you’re trying to stuff inside. The price is higher, too. It starts at $156,000, but options like $10,600 Carbon-Ceramic brakes, $1,500 wheels, and $9,000 exterior carbon fiber trim, the price can quickly grow to $200,000. 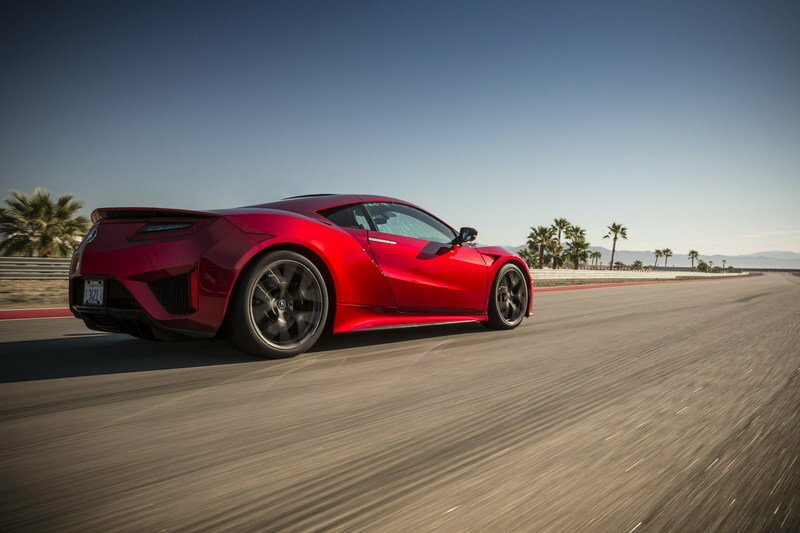 Read our full review on the 2017 Acura NSX. The BMW i8 is a modern marvel of automotive engineering and design. Its sleek lines and leather-lined interior are its main course, while the gasoline-electric hybrid powertrain is the cherry on top. It’s an excellent first foray into the newly created segment for BMW. Still, the i8 is confused about what it wants to be. 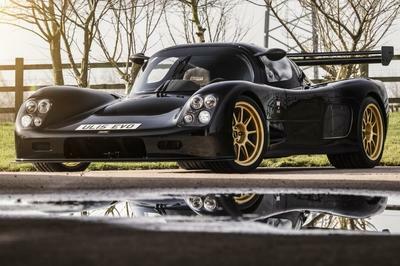 Its performance figures technically disqualify it from the supercar category and its 15-mile range and 28 mpg combined rating only make it an average hybrid. Add to that the everyday livability issues of a cramped trunk, tight rear seats, and the wide door sills that require a contortionist’s skills to slide over. Yet despite its flaws, the BMW i8 is an impressive machine that’s completely worthy of the attention it receives from onlookers. 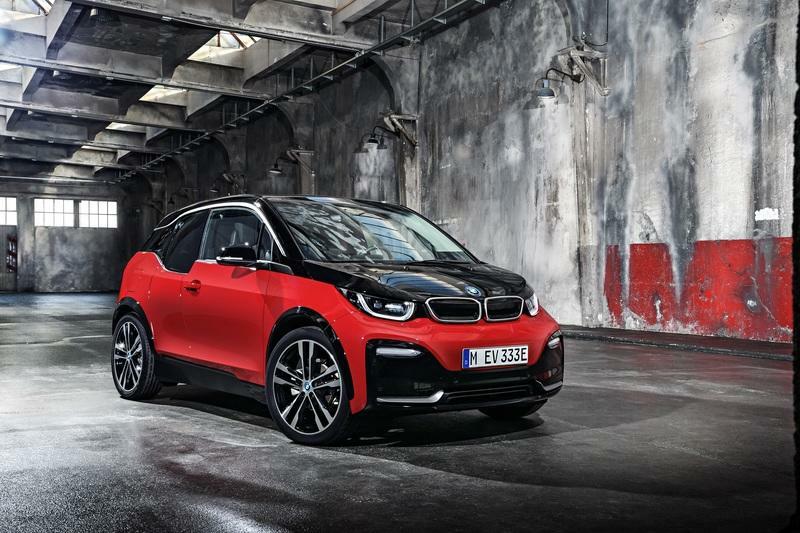 BMW has done a fantastic job making a high-performance hybrid with a serious lust factor that remains fresh after two years on the market. The i8 will definitely go down in history as a high point in the automotive world, not only for its sultry aesthetics, but also for its cutting-edge powertrain and use of space-age materials. 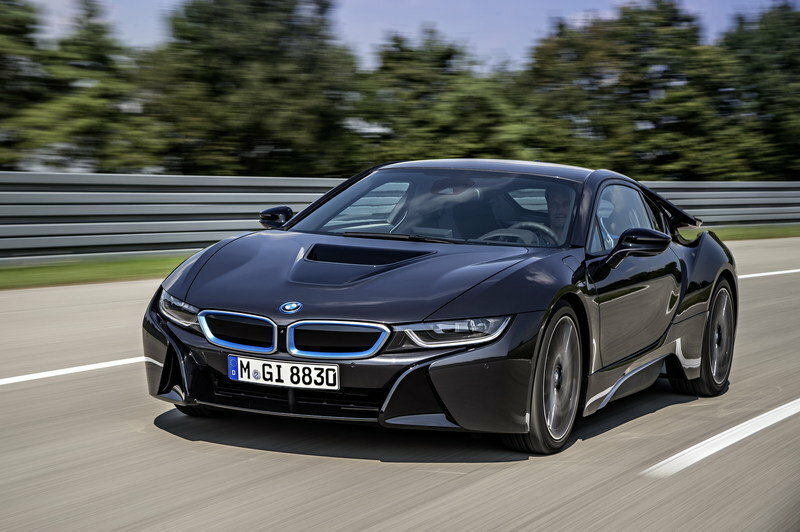 Read our full review on the BMW i8. 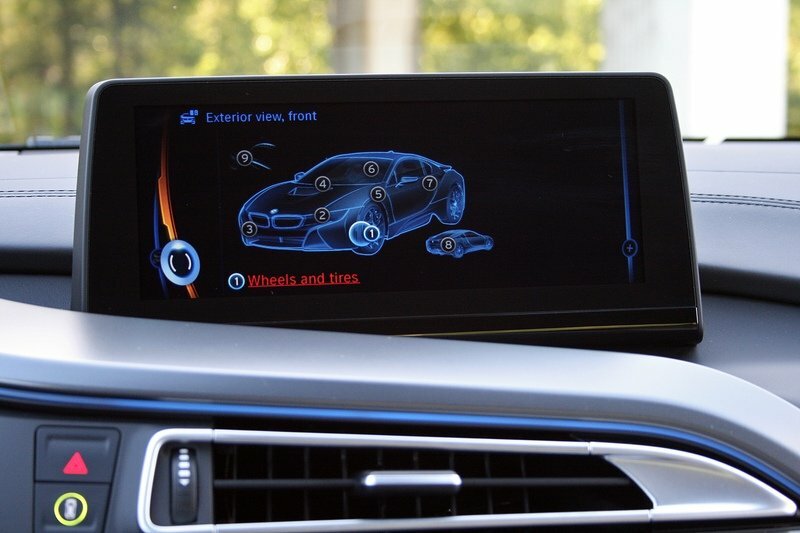 Read our full review on the BMW i3.